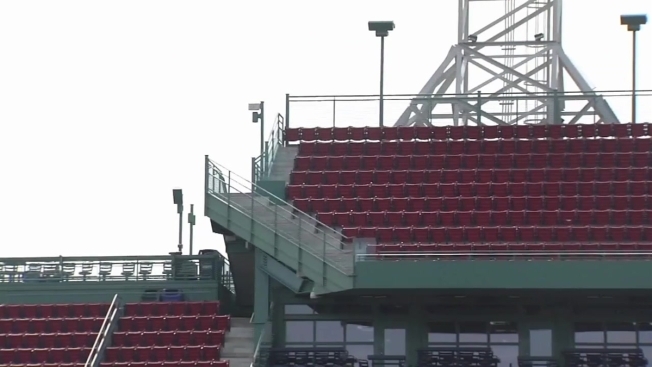 It may be the oldest ballpark in the league, but there are some new features at Fenway Park this season. From a breakfast burger to a new logo on the Green Monster, fans headed to Tuesday’s home opener will notice some changes. “You’ve got a 107-year-old home, so you've got to treat it with tender, loving care,” Red Sox president Sam Kennedy said. With Red Sox Nation hungry for another title, Chef Ron Abell is ready to feed them. He is the MVP in the kitchen at Fenway and ready to hit the cuisine out of the park. Forget peanuts and cracker jacks; the new lineup includes a lobster BLT, buffalo chicken totchos and a dessert called the banana splitter. “You can hold it just like a Fenway frank if you want to and let it drip down,” Abell joked. Once fans digest, they will notice the Green Monster has a giant new MGM logo advertising the resort and casino in Springfield. Kennedy said he is thrilled with the partnership and hopes the state will allow sports betting at Fenway one day. “Any way we can get people involved in our sport is a good thing,” Kennedy said. Another way for fans to get involved is a little more high-tech. There are 38 new augmented reality points throughout the park. From plaques of past players to bobbleheads of current ones, fans can download the MLB app and use the camera to make elements come to life.